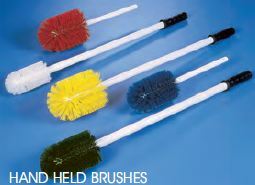 Large brush is two-piece with head firmly threaded onto handle. No “nails” or “pins” to lose or contaminate product. 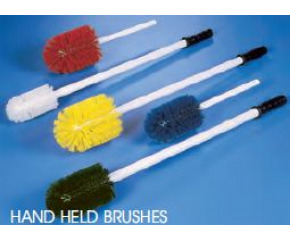 Small brush is one-piece, both are medium-stiff crimped polyester. Effective cleaning for a variety of applications...valves, outlets, small tanks, beverage dispensers, etc.